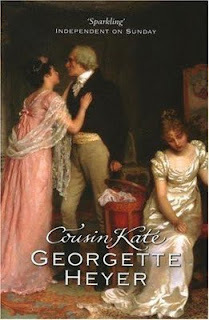 Wicked Wonderful Words: Review: "Cousin Kate"
So when I had to spend two weeks doing nothing due to an operation in my left leg (almost at the end of the two weeks now), I turned to Georgette Heyer for a bit of a regency romp. Usually I have very clear expectations of what I will get from a Heyer book and they always live up to my expectation. Always until this time that is... Because Georgette Heyer's "Cousin Kate" certainly did not. The story line is this: young Kate is all alone in the world and has not a penny to her name. So she goes to stay with her old nanny Sarah who is now married to a tradesmen. Sarah contacts Kate's family and soon Kate is swept away to live in the imposing and impressive country home of her aunt Lady Minerva. It is by no means a homey place - more of a museum - and the family is as dysfuntional as they get. Kate spends her time with her cousin Torquil who is more than a little strange, and Phillip, who doesn't seem to like her at all. And all the time Lady Minerva is acting strangely. This is actually more of a mystery than a romance which I didn't particularly appreciate. I prefer the London balls and Bath tangles to a country house who-did-it. Also what I so adore about Georgette Heyer is her strong heroines. They are normally really strong with lots of common sense and little romantic notions but Kate doesn't really have that. Yes she is practical and no-nonsense but she is also naive and not particularly bright and she annoyed me at times. Read it if: You are on a quest to read everything Georgette Heyer ever wrote. If you are looking for a regency romance of great quality, go for Georgette Heyer's "Frederica".